Placed an order for a bunch of these bags for my workshop and couldn't be more happy with the outcome. The bags are very unique and love that they are eco-friendly. There's no doubt in my mind that Custom Earth Promos is an outstanding company to do business with! I ordered a bunch of these bags in bulk and received them punctually. Also, couldn't be more pleased with the quality and beautiful color selections Custom Earth Promos offers. Highly recommend using them! I was determined to use Custom Earth Promos and they came in clutch! Not only were the bags very affordable but the quality of the bag was WAY more than I was anticipating. Whenever I place an order with CEP's they never disappoint. I've been doing business with this company for years now and they are very professional. Customer service is top notch and I received the bags in a timely manor. We ordered a bulk quantity of these bags and received them within our required time frame. We are already running low since our customers have been eating them up!! I ordered these bags a couple weeks ago and I like how vividly my company's logo stands out against the color of the bag. I thoroughly enjoyed working with Custom Earth Promos and will again in the future. I was very pleased with my recent order of these bags. They not only look good, but are very versatile. Our company logo printed perfectly, Very impressed with CEP! My company was highly impressed with CEPs products and service. Love the size and handles on this bag. The long handles on this bag are perfect for our customers. So happy we ordered through CEP. So glad we ordered these bags. Finding a budget friendly bag that is also eco-friendly is a task but CPE made it easy! So glad we ordered these bags. Finding an eco-friendly option that doesn't break the bank can be difficult but CEP made it easy! We needed bags on short notice for a convention and CPE made it happen! Thanks! So happy we ordered these bags! They are perfect for any budget. These bags have a nice, classic design that I really love. The quality of them is great as well! These bags are perfect choice for anyone with a small promotional budget. We are so excited to finally have our own bags! These bags are small budget friendly and high quality. Could not be more pleased! Customizing our earth-friendly totes was really cool. They came out great. I was even more impressed with the delivery time, much quicker than expected. Our beach club committee decided to customize these tote bags for all our members. It was a great idea, everyone is very enthusiastic about them. I like that they also promote our club and are eco-friendly as well. Our non-woven tote bags will ease the transition from disposable to reusable grocery bags, and its economical design will save you a bundle. Choose from over 30 stock imprint colors, and let our design team create truly memorable promotional totes at the best wholesale prices. Reusable bags are now affordable enough for even the smallest advertising budget! The classic "wraparound" design of these eco-friendly bags allows them to become up to 20 inches across for carrying wide objects or up to 8 inches deep for toting around thick items. If you've always wanted your logo on a promotional bag, now's your chance to finally do so! With our price match guaranteed wholesale prices, any advertising budget can afford our reusable, non-woven bags. 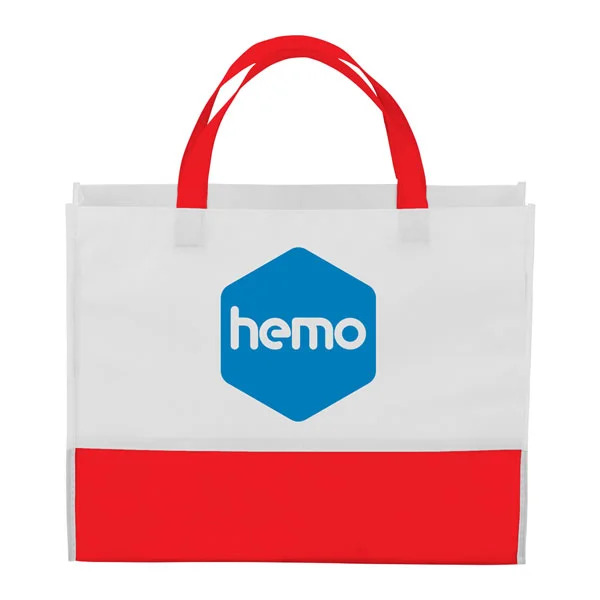 These lightweight 80 GSM non-woven polypropylene promotional tote bags are an excellent alternative to disposable plastic bags. Available in-stock in 15 popular colors, this cost-effective reusable bag is convenient for all occasions and can be decorated for FREE with one of over 30 in-stock imprint colors. What's more, with a low 200-piece minimum quantity requirement, even small businesses or private events can now have their very own customized eco-friendly bags! If you plan ahead, we can save you even more money by offering long term production for quantities over 1000 pieces. Ordering directly overseas will add even more value to our reusable tote bags. Our overseas factory stocks over 40 non-woven fabric colors in 3 different densities, and can even custom-dye the fabric to match a specific PMS color for orders over 10,000 pieces! That's just where the customization options begin: we can also imprint in multiple locations with any color ink (even glow-in-the-dark! ), and add hangtags or folding pockets. We can laminate the polypropylene for extra water repulsion, or add snaps and Velcro closure. We can even design a bag with your specific dimensions in mind; a popular option for oversized items such as take out containers. Don't let plastic bag bans get in the way of your business; you can now offer your customers an inexpensive, earth-friendly alternative to disposable plastic bags, at prices so low you can afford to give them away!